Opening a hybrid laundromat is a great way to combine two profitable businesses under one roof. If you are interested in starting a laundromat-bar, laundromat-cafe, or any other type of hybrid laundromat business in California, the experts at Golden State Laundry Systems can help you turn your business dreams into reality. 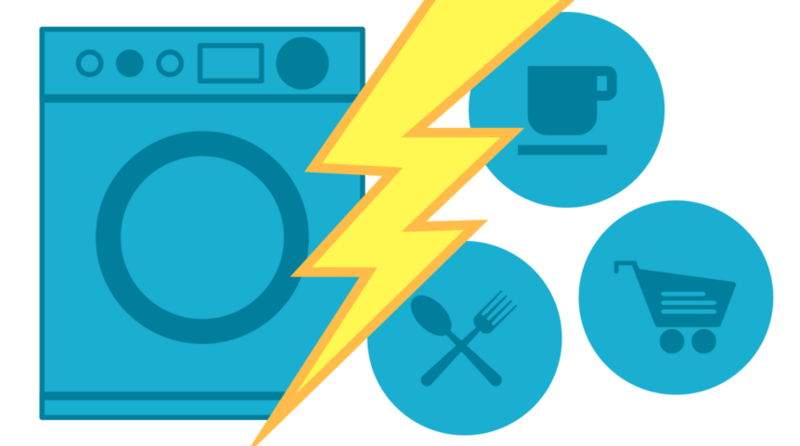 Why a hybrid laundromat? It’s about time! Laundry takes time, and laundromat owners employ many different strategies to deal with this wait time. Many owners stock their laundromat with high-speed, high-capacity washers to help customers get more laundry done in less time. Others remove the wait time from customers by offering wash & fold and delivery services. But some owners turn this wait time to their advantage by pairing their laundromat with a complementary business like a cafe or restaurant. If this sounds like the business for you, here are five steps you can follow to open your own hybrid laundromat. The most common type of hybrid laundromat is the laundry cafe/restaurant. But there are any number of businesses you could pair with your laundromat. A laundry/games arcade, a laundry/salon; if you think a business could succeed in your area, you can pair it with a coin laundry. If you plan to open a hybrid/laundromat, you should contact your local commercial laundry specialist in the very early stages. There are many things to consider when entering into the coin laundry business, and of course, if you are in California, Golden State Laundry Systems can help guide you towards success. Choosing the right location can make or break a laundromat venture, and with a hybrid laundromat, location is doubly important. If you plan to open a hybrid laundromat make sure you look for a location where demand is high for both of your services. Commercial laundry equipment has specific requirements for utility connections. Consulting with contractors familiar with these requirements is essential before embarking on your project. Luckily, the Golden State Laundry Systems staff includes laundromat owners and general contractors — we’ve got you covered. Golden State Laundry Systems has a wide range of energy and water efficient coin laundry equipment for you to choose from. And because many of our experts are laundromat owners or former laundromat owners, we can help you choose the right mix of equipment based on your budget, store size, and neighbourhood demographics. The best time to attract new customers is when you first open, and holding a grand opening is a wonderful opportunity for you to get potential customers through the door. Golden State Laundry Systems can help you plan and market your grand opening, as well as helping you market your laundromat long term.